Weren't you supposed to be able to redeem those only when the phone arrived (from the phone or with IMEI)? What that's crazy! I thought you redeem when you get the phone? I think those are for the people who bought thru Samsung. Instead of e-gift card...why not expand using other colors. in Dubai all the S10 pre-orders say out of stock since yesterday! The S10+ and S10e are still available though! They are selling the S10s like hotcakes! So if I am going through Best Buy I'll be able to get and redeem? And if my husband ordered his on the 21st or 22nd he will be getting them cause they weren't sold out then? And does it mean you can use the e-gift card to buy them once they are back in stock? Good, I would rather have the black instead of the white. I would guess anyone who ordered from Samsung and invoice shows buds will get them. Don't know whether the reserved #s for other retailers. It says in fine print if sell out they give the gift card. I would assume you can buy anything have on site with it. Yeahhhh, this is not true. Yeah, but sometimes trying to get a popular item can be a PITA. I tried that a few years ago with a speaker...took forever to get it. Ended up just getting the credit back and giving it to someone who wanted accessories from there. I was thinking same thing if true! 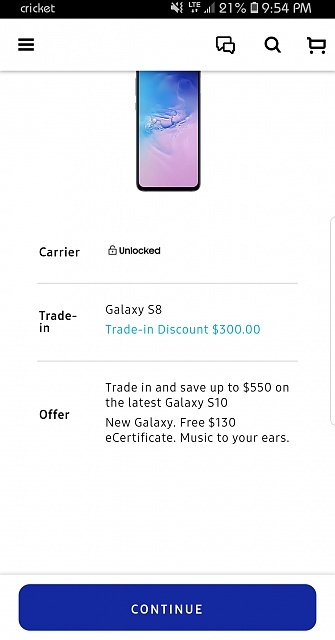 Since all the offers had to be redeemed through Samsung that has to be the only option? Those who ordered directly from them will get them first, and anyone else will get the e-gift certificate. No idea how they will provide that to people who bought from say Best Buy. Oh ok thanks! I was just curious cause I do want them even if I have to wait. There was always a "while supplies last" stipulation. It's in the small print. There's not an endless supply. I don't know if the "sold out" is only for Samsung direct customers, or everybody. I'll take a gift certificate. I don't want White earbuds anyway, so I'm not pressed. I called Samsung customer care. I was told I am pretty sure and then he said no a 100% sure that if you already pre-ordered before we ran out you will still get them. I said oh cause I pre-ordered at Best Buy on the 22nd and he said then you should still get yours. I guess I'll wait and see. If not I'll use my husbands and get me the duo charger they have a new one where the phone side is fast charge 2.0 but it's a pad I am hoping they make one with a charging stand. Samsung is still advertising the promotion and there is zero indication whatsoever that this is true. What is more likely is that they have a set supply of the Buds, and they have to reserve a set number for carrier customers so they have switched their own customers to the ecertificate. Does this mean new preorders from carriers won't get the buds? Oh well. The Galaxy Buds retail for $130, so those of us who pre-ordered can just wait till they're back in stock and buy them. Or pick something else from the Samsung store. Probably gave too many away to all the dorks on YouTube. sergysn and Darwm like this. Even if they're sold out, you can always just wait for them to come back in stock and use the gift certificate. You can also get whatever color you want then too. I would rather just have the 130 if there phone.